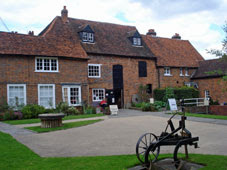 Mill Green Mill: There's been a mill on the Lea between Welwyn and Hatfield since medieval times. Around it grew a small village called Mill Green, and the the mill's now known (rather circuitously) as Mill Green Mill [photo]. Usual story - fell into disrepair in the early 1900s, restored by a team of volunteers in the 1980s, now run as a museum by the local council. And all rather lovely, apart from one tiny technicality which was that every single person who works there completely ignored me when I visited. The volunteer sitting out the front in a chair by the 'Open' sign, he ignored me. Neither was there anybody at the entrance desk - not that the mill costs anything to visit, but I could easily have walked off with all sorts of local goodies from the shop. Downstairs were a few tiny well-stuffed galleries, including the Miller's Kitchen, some stuff about local railways and a temporary exhibition on Murphy wireless and television sets. Upstairs another volunteer was milling grain - properly with stones and spinning wheels and things [photo] - whilst explaining carefully to a father and young son how it all worked. As visitor number three, I didn't even get a nod. I slunk off to check out the millrace (dark and damp) before exiting to the delightful garden where cream teas were being served. I'm assuming that the scones were made from ultra-locally-sourced flour, but I felt 20 years too young to stop and find out, and nobody at the café entrance paused to entice me in. I suspect you might get rather more attention if you turned up. Hatfield House: The young Princess Elizabeth (Tudor version) spent much of her childhood at the Royal Palace of Hatfield. The present Jacobean house dates from 498 years ago, and was built by her courtly favourite Lord Cecil. Today Hatfield House is a very popular tourist attraction (rather more so than Mill Green Mill), forever putting on big special events during the summer season to attract paying guests inside. I decided to give the place a miss, partly because of the £10.50 entrance charge, but also because of the three mile detour required to reach the other side of the wall from Mill Green. I missed out on seeing the 16 acre Broadwater, formed by a dam in the river Lea and landscaped with a spectacular oak backdrop. Instead I trudged along the A414 dual carriageway, following the estate boundary, as far as the Cecil family's sawmill [photo]. It still churns out profitable stacks of timber - including at some point (I suspect) the chopped-down remains of the oak tree beneath which Princess Elizabeth discovered she was Queen. At the sawmill I took a risky decision and chose to abandon the official route of the Lea Valley Walk. This has been revised recently due to the closure of a permissive path (somewhere), which requires a detour to the suburbs of Welwyn Garden City followed by a featureless three mile walk along a disused railway. Not a scrap of river in sight, no thanks. Instead I took a delightful bridleway along the banks of the Lea, past secluded angling platforms and a plankless bridge [photo], with not a single other walker in sight. The surrounding cornfields were the first I'd seen harvested, and a reminder that summer's glories won't last forever. A faded sign on a farmyard post revealed that I was on the original LVW, which could only mean trouble ahead. So then the grim bit. There was no footpath for a mile and a half, nor any sensible off-road detour, so I was forced to walk along a busy B-road avoiding all the traffic for 30 minutes. I strode carefully (swish) round a series of shielded high-hedged bends (swish), and was surprised by how many of the oncoming (swish) vehicles (swish) had personalised numberplates (swish) (swish). After Holwell Bridge the Lea was completely out of sight, either lost within the estate of an exclusive polo club or merely hidden inside a private wood. I was glad to finally escape from the road at Water Hall Farm... until I discovered that I was entering a rubbish tip and had to step carefully to avoid being mown down by huge yellow dumper trucks. Eventually the rubbly hillocks gave way to grassy fields - the latter reconditioned from the former by the tip owners. I passed one of the Environmental Agency's official gauging stations - a weirside hut where the Lea's flow is constantly checked to alert the authorities of flood or drought. Then on up the valleyside ridge, beside fluffy teaselly hedgerows, for a fine view of distant Hertford nestling amongst the surrounding hills [photo]. Ah, I thought, this route sure beats trudging along a dull old disused railway. And then I reached the dull old disused railway (now the Cole Green Way) and reluctantly trudged along to its shady conclusion. A railway viaduct (and a lone horse) [photo] heralded the outskirts of Hertford, followed swiftly by the stadium of the town's football team. I say stadium, whereas I really mean a couple of rickety grandstands and a few portakabin huts. Hertford FC aren't having the best start to their league season (played 2, lost 2), and you'll get some idea of their professional standing if I tell you that they've already been knocked out of the 2010 FA Cup. The Lea flows up the eastern side of the ground, where it then joins with its first major tributary - the Mimram. Bolstered by additional supplies, the river flows into the centre of town noticeably wider than before. Hertford Castle: As many as four different rivers combine at Hertford, so it's been an important settlement for more than a millennium. 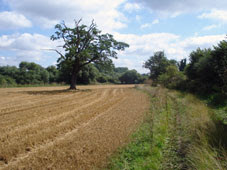 A castle appeared around 1066, of the motte and bailey type, and its grassy mound is still visible beside the Lea today [photo]. A succession of royal owners took charge, and made regular visits, until Henry VIII finally upgraded the castle to a proper palace. Queen Elizabeth brought Parliament here when London was beset by plague, although King James I was less enamoured by Hertford (poor hunting nearby) and the palace left royal possession. The castellated 16th century building that survives to be called 'Hertford Castle' is really only the gatehouse. Today the building is used as council offices, and opened to the public once a month. The surrounding area is a lovely quiet spot [photo] - a patch of municipal parkland bang in the centre of town surrounded by an (unseen) busy ring road. If you worked nearby, this is surely where you'd bring your packed lunch for a Leaside nibble.  Griff Rhys Jones is heading down the Lea for his BBC1 Rivers series at 9pm tonight. He'll be spending almost all of the programme visiting the lower half of the river - the bit I haven't reached yet.